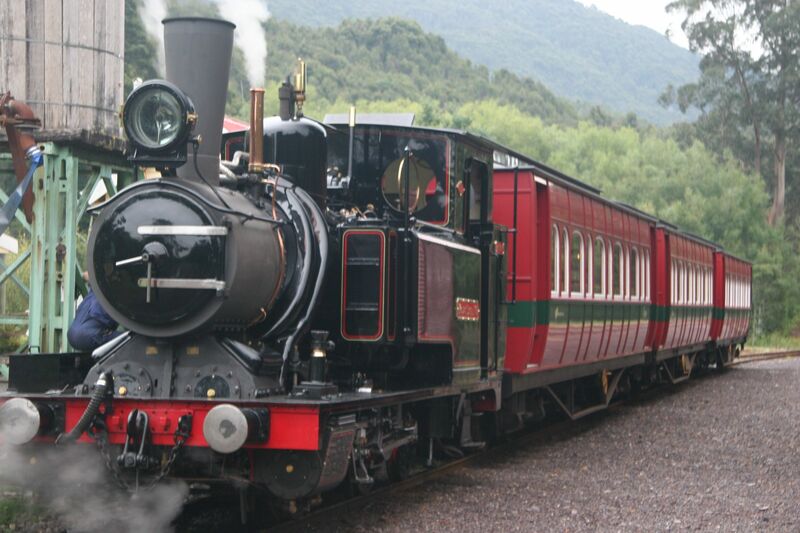 The day has arrived that we have been waiting for – the rail trip on the ABT Railway! Up very early and waiting for the bus to take us to Queenstown at 8am – raining, windy, completely different to yesterday’s 35 degrees. Our bus was late, but once aboard, everyone forgot about being wet. It was a state-of-the-art bus, very comfortable and with seat belts. After collecting more passengers at the second stop we were off to Queenstown. We were last in Queenstown 40+ years ago, where we saw the hills looking like a moonscape as a result of mining copper, caused by pollution of the sulphur coming from the smalting of the copper. 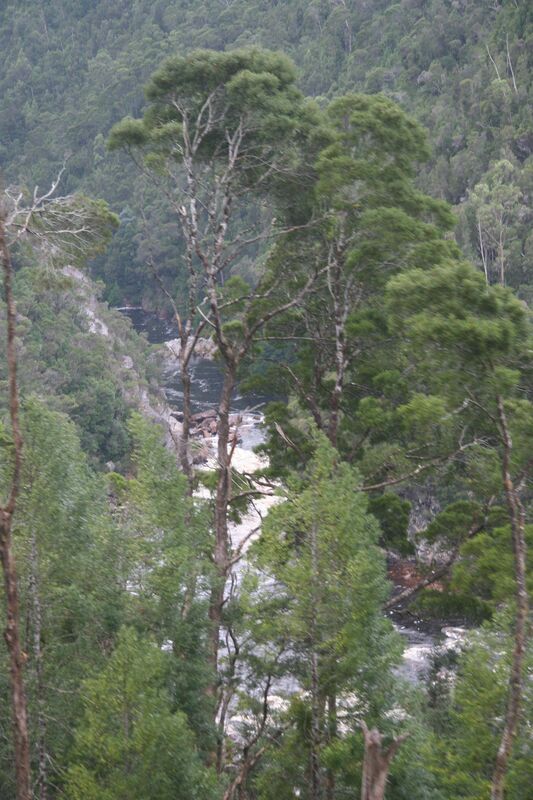 It’s great to report that the hills now have some greenery on them, but the Queen River is another matter. 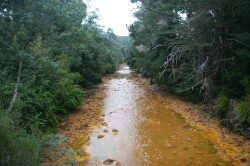 It is orange, but at least it is flowing again, instead of the ‘wet cement’ that it used to resemble in the 1990s!! 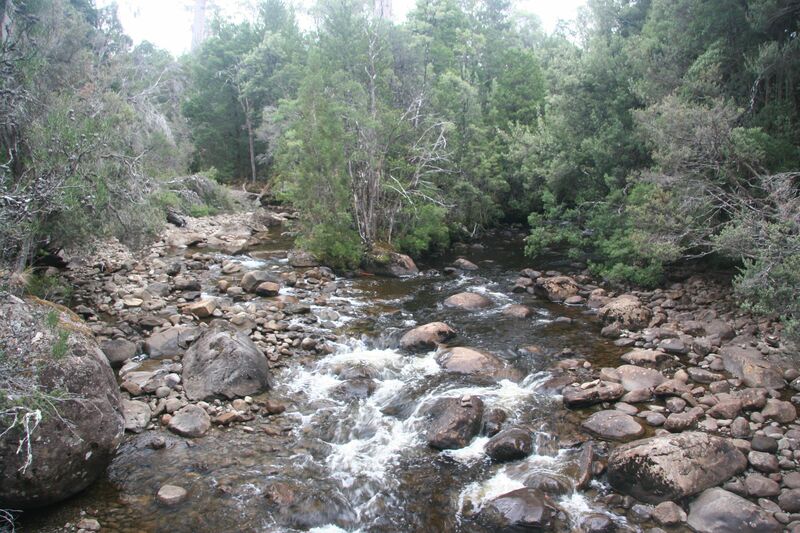 Unfortunately, it runs into the King River – a much bigger and magnificent looking river, but unfortunately it is now polluted and it is predicted that it will take 1000 years to be pure enough to house water creatures again. Now, back to the trip. There was a video on the bus about the history of the mining and the reason the railway was put in. It’s amazing what our pioneers had to do to get their product to the sea, for shipment. In the late 1800s they built a railway through a this rugged mountain range, in extreme conditions – taking two and a half years in total. Swiss Engineer Dr Roman Abt devised a third rail of solid bars with vertical teeth. Small cogwheels under the loco engage with teeth on the middle rail, which enabled the tain to climb and descend 1 in 20 inclines. Without this technique the line would have had to be tunnelled through the mountain at a prohibitive cost. 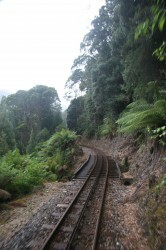 The railway was closed in 1963 and in 1998, the Federal Transport minister, Mark Vaile, announced $20.45 million in funding to rebuild the railway. The railway took more than 3 years to rebuild. We were in the Premier carriage – treated ourselves – and we were greeted by Taylor, who was looking after us all for the trip. We all were handed a glass of champagne and we had allocated seats, we think they were allocated by alphabetical order. We were in the last carriage, and we were facing opposite way to the the direction the train was going, so we were looking out on the path we had travelled. 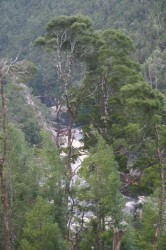 Seeing it winding through the cuttings, the spectacular forests and over all the bridges, was wonderful. We were served a chicken and brie pie for morning tea, later, a brownie, all washed down with as much wine as you wanted. Soft drinks, tea and coffee were also served. Lunch was served at one of the four station stops and consisted of two small rolls, one with smoked salmon and the other with ham and lettuce and tomato. Back on the train and as if we hadn’t eaten enough, we were offered a cheese platter for afternoon tea. The trip was interesting all the way, through Tasmania’s beautiful rainforest, and climbing up the very steep ascent, with the aid of the special cog mentioned earlier. There was no chance of the train slipping back or, when going down, sliding forward. We went over some very high bridges, but we felt safe all the time. 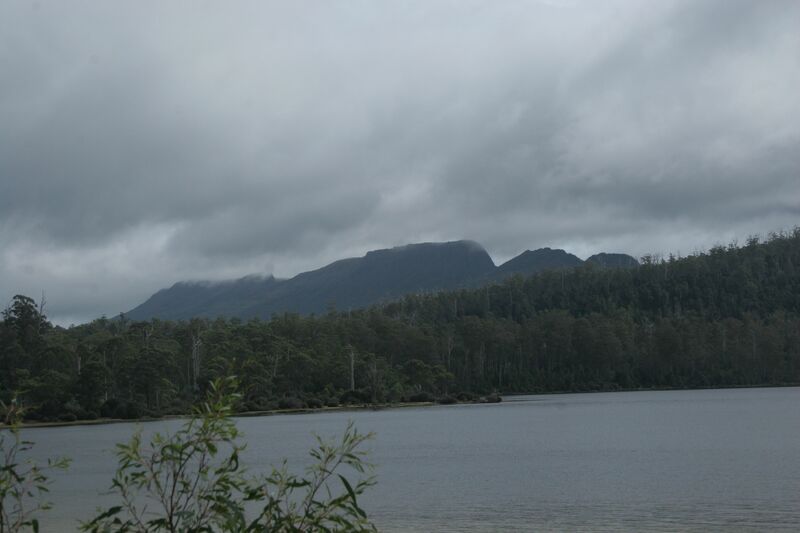 Finally back in Strahan, we felt exhilarated and thought it was money well spent. 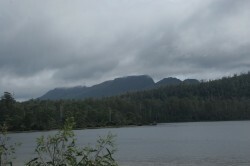 Next day, packed up in the rain and set off for Lake St Clair. There was the steepest climb experienced so far, driving out of Queenstown. 5kms was enough for me. The rest of the road had a few sections of climbs and bends, but nothing as bad as the beginning of the trip. We only had to travel 140 kms, but this takes hours, because of the bends etc. Arrived at Lake St Clair and we were incredibly disappointed with the camp ground. The sites are tiny and everyone was crammed in like sardines. We had a large van a metre away from us. To add more to our problems, there was no water pressure, so everyone had to rely on what water they had. We went for a lovely walk in the afternoon, slightly drizzling, but not enough to saturate you. 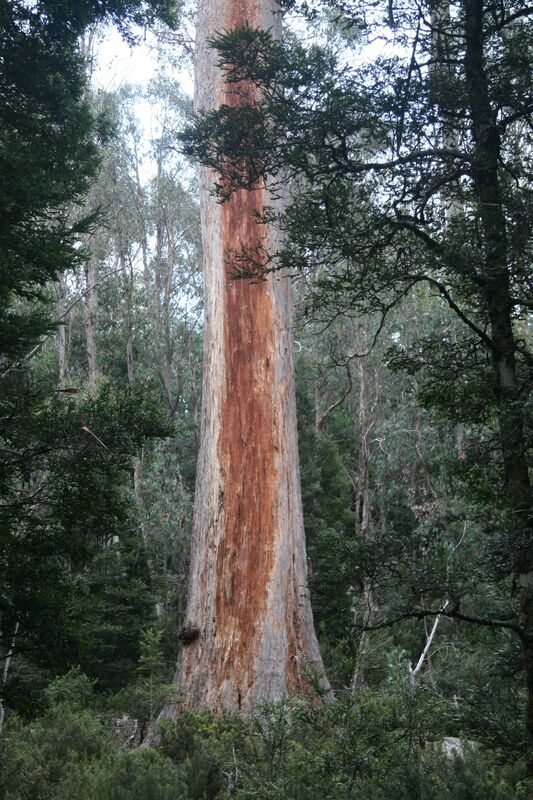 Everywhere you go in Tassie, the forests are breathtaking. 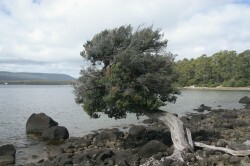 The lake is the largest and deepest in Australia, with a depth of 167 metres. It was formed from the last lot of glaciers, 10,000 years ago. Large rocks were pulled along by the glacier, and these are deposited around the lake. Russ took a photo of a fabulous bonsai tea tree, also showing some of the large rocks. Russ went for a walk this morning, while I was typing the blog. He walked to the junction of the Cuvier and Hugel Rivers. This was a short walk, though dry eucalypt forest. He then did the Aboriginal Heritage walk, which he found extremely interesting and moving. Loads of information about their time here and their unfortunate demise, due to the settlers and duplicity of the Tasmanian Government. Also was stunned by the size of this massive Swamp Gum. This is Mt Olympus, seen at the end of the walks. 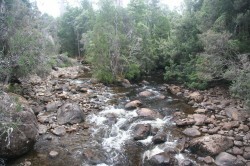 We are heading to Mt Field National Park tomorrow – can’t book – hopefully the sites will be bigger, if we get in, that is.